Stacktight is a company that makes packing material for other local businesses in the Carrollton, Kentucky area. 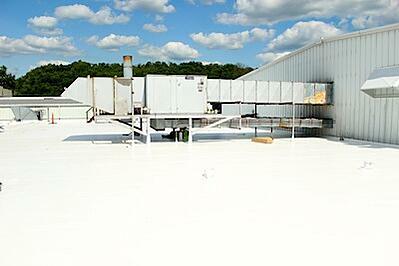 The flat Duro-Last roof of the company’s 20,000-sq.-ft. factory had been damaged by hail. The building’s roof saw high foot traffic due to maintenance, repairs and daily routines, causing the initial damage to degrade much quicker. That wasn’t the only problem. Decay and water had built up on the roof over time. This created a serious business threat to Stacktight’s operations, as the packing materials produced by the factory are water-sensitive. With local businesses counting on their product, Stacktight needed a contractor who had extensive flat roof repair experience. That’s when they called Exterior Pro. Exterior Pro Roofing arrived on the scene expecting to perform a layover job without a tear off. After inspecting the flat roof, we discovered that the heavy foot traffic and hail created multiple leaks in the existing Duro-Last membrane. As a result, the fan fold insulation underneath was completely saturated with water, meaning a standard Duro-Last rubberized roofing layover wasn’t an option. A tear-off on an industrial building of this size would be one of the most challenging jobs in Exterior Pro Roofing’s history. We had to get creative in order to do the flat roof repair correctly. After further inspection it was revealed that the first level of the roof (comprised of tar and gravel) had not yet been ruined by water. This gave us the opportunity we needed to come up with a solution. We recommended a partial tear-off. 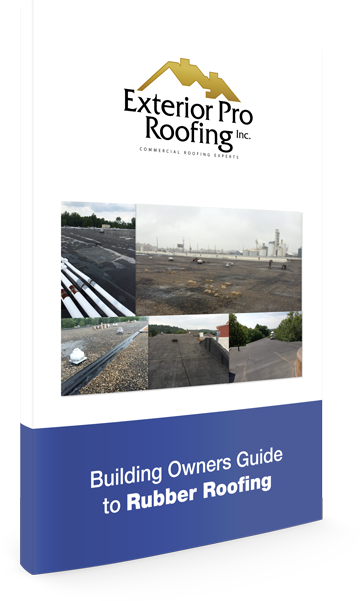 Since the first layer of the roof is exposed, any roofing torn off needed to be replaced within the same day to ensure no water leaked into the factory’s interior. By removing the Duro-Last and saturated insulation section by section, we were able to ensure that the first layer of flat roof was never exposed overnight. In its place, we installed new ½-in. fan fold insulation, and laid a new 40-mil. Duro-Last membrane over top. We also installed new roofing trims to improve the building’s aesthetic. Exterior Pro Roofing also went the extra mile by removing all of the unnecessary material and debris that had collected on the roof. Removing this debris eliminated several potential leak spots that could have caused issues in the future. 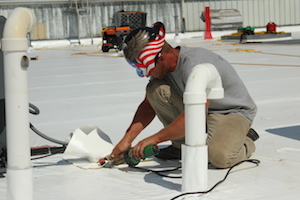 Industrial roofing is full of challenges, surprises and unexpected complications. Through creative problem solving, hard work and extensive expertise, Exterior Pro finished this flat roof repair in only 5 days. And, thanks to our quick, efficient industrial roofing installation, Stacktight’s operations are no longer in jeopardy.